The blue mountains above Walla Walla offer a vast array of subtly different shades of gold and green. The broad open sky is like a big aaahhhhh. 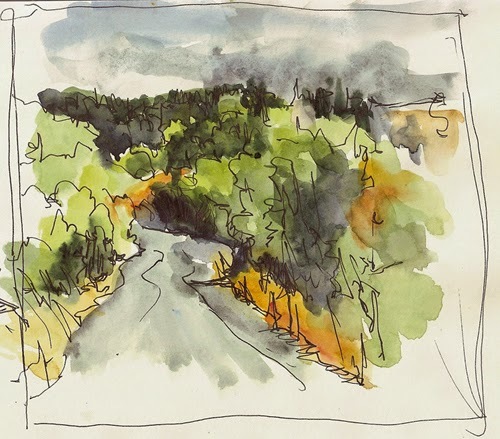 I stopped on the gravel road and did this very quick sketch because of the colors. In town the sidewalk cafes were full of visitors and locals. Lot's of tasting rooms line the streets, but this one section of Main Street is lined with outdoor seating. The Die Bruke (bridge) building sits on the busiest corner of downtown. and according to the walking tour of downtown Walla Walla, it is so named because it spans Mill Creek which runs through downtown emerging just next to where I was sitting. Starbucks sits on the other side of the street adding to the pedestrian traffic. Students with parents in tow were just arriving in town for the opening of the fall session at Whitman. 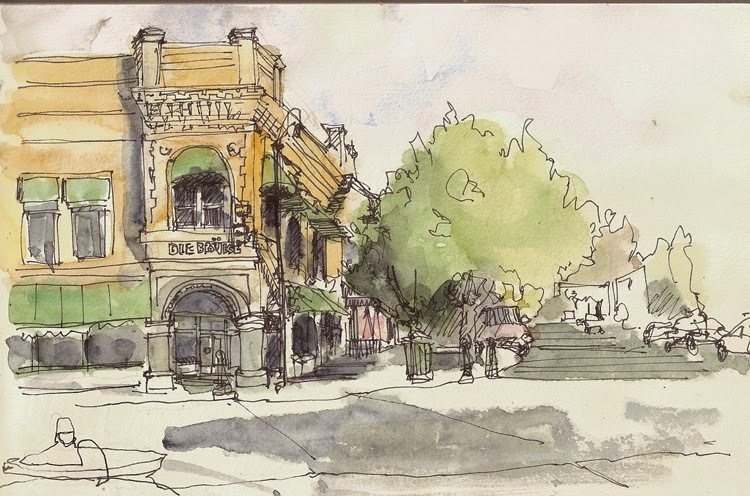 I did a quick Google search to learn about the Die Bruke and found Jim Bumgarner's sketch on flickr among the first in Google's links. Beautiful sketches Jane. I love the panorama of the hills. Jane I love your palette and as usual a great job!